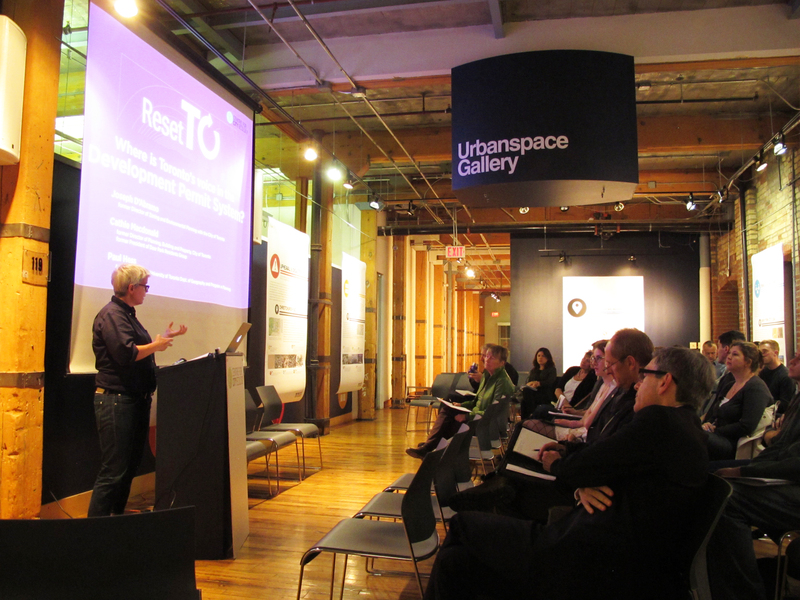 The discussion, moderated by CCE Director Annabel Vaughan, began with an introduction by Joseph D’Abramo and an overview of Toronto’s Development Permit System, adopted by City Council in July. The adopted by-laws permit the Development Permit System to be used as an alternative to the traditional zoning by-law in areas specifically designated by Council. While a number of neighbourhood have been recommended as sites where a DPS system could be used, the system has not yet been enacted on the ground here in Toronto. This has left many with questions as to how the system will be implemented and what impact it will have on our neighbourhoods and city as a whole. Cathie Macdonald responded to the DPS from a community perspective, exploring how the system might impact communities as the neighbourhood scale. Cathie proposed working groups to guide the initial implementation of the DPS and how community voices could be included in the discussion in meaningful and lasting ways. Paul Hess then responded from a policy perspective, posing interesting questions as to how the DPS could impact neighbourhoods in need of development (rather than those wishing to curb the tide of rapid growth), and how the system might function with respect to the Ontario Municipal Board. The audience of 50+ contributed excellent questions that fuelled conversation during the Q&A. Thanks to all those who presented and attended! There are existing area-based alternatives to site-by-site planning, including Area studies and associated Official Plan Amendments, Secondary Plans, Heritage Conservation Districts, etc., which also encode the community “vision”, and which do not subsequently remove resident’s rights to consultation and appeal. So why go for the DPS instead of one of these other area-planning alternatives? Keesmaat’s oft-cited reason–used to push Toronto’s DPS policies through council—is that, after enactment, there can be no appeals to amend the by-law on a site-specific basis. In other words, residents are being encouraged to trade away their rights in exchange for some hard-and-fast certainty about the maximums. But it turns out to be straightforwardly false that site-specific appeals are not allowed: many top planning lawyers (e.g., Dennis Wood and Calvin Lantz) have confirmed this, and Joe D’Abramo himself acknowledged this to me in conversation. What is true is that the Toronto DPS policies make it a bit harder (but not too much harder, on pain of violating the Planning Act, which guarantees the right of site-specific appeal) for developers to make such appeals. Meanwhile, there are huge risks, especially for high-growth areas, associated with going through the DPS process. For contrary to the usual spin, there is no guarantee that the DPS by-laws will reflect “the community vision and objectives”: even if there is consensus after the front-end consultation, what Planning comes back with may greatly depart from what the residents, etc., want (as Planning looks to the OMB, among other pressures), and moreover, developers can appeal to change the DPS by-law parameters to the OMB—and if the OMB sides with them, then the day after the decision, the new parameters rule, and residents thereafter have no right to be consulted about or to appeal any DPS permit application. Google ‘The DPS from the community perspective’ to see these and other points (e.g., the huge outrage Vancouver’s version of the DPS has provoked among communities) discussed in more detail. And those interested should feel free to contact me.